RTI Act confers right to access to information held by a Public Authority on all Citizens. The Act also prescribes remedy, when such a right is denied to a citizen. 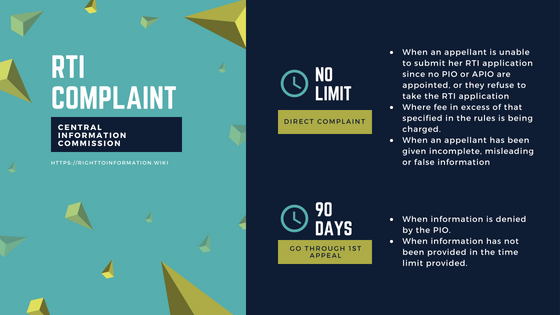 When an applicant do not receive a decision on his RTI Request within 30 days or is aggrieved by the decision, applicant can prefer an Appeal under Section-19(1) and further appeal under section-19(3) before the Information Commission within time limit. In such an appeal, the applicant can seek relief to supply information by PIO. The second appeal under section 19 (3) of the Act is filed against an order of the FAA in a public authority or when the FAA does not make a decision within the specified time. A complaint under section 18 of the Act may be filed directly on the grounds mentioned in sub-section (1) of this section. The main difference between a complaint and a second appeal is that in the case of an appeal, this Commission may pass orders directing the CPIO to provide the requested information to the appellant in appropriate cases whereas such orders cannot be passed while dealing with a complaint. When an appellant is unable to submit her RTI application since no PIO or APIO are appointed, or they refuse to take the RTI application. When information is denied by the PIO. When information has not been provided in the time limit provided. Where fee in excess of that specified in the rules is being charged. When an appellant has been given incomplete, misleading or false information. Any other matter like noncompliance of Section 4. For 2) and 3) above a provision for a first appeal is also there as per Section 19. These cases apply to the first appeal under section 19 since it applies to both non-decisions and any decision of a PIO. Most Commissions do not entertain an appeal in this matter until the first appeal has been made. Hence, it would be a good practice for appellants to file complaints to the Commission for matters covered by 1), 4), 5) and 6) and file first appeals for 2) and 3). When an applicant is denied access to information by various reasons specified in Section-18(1), Applicant can file Complaint directly before the Information Commission. There is no time limit for filing a complaint. Under the complaint proceedings, the Information Commission cannot direct PIO to supply information, but can only conduct an inquiry and impose a penalty on PIO or recommend disciplinary action against PIO, for the reasons as enumerated under Sec-20. When an information is denied without any reasonable cause, the applicant is entitled to invoke both the remedies - Second Appeal as well as Complaint. Sections 18 and 19 of the Act serve two different purposes and lay down two different procedures and they provide two different remedies. One cannot be a substitute for the other. A second appeal or a complaint can be filed electronically on www.cic.gov.in online along with the requisite documents as per RTI Rules, 2012. The documents must be duly signed/ self-attested/ verified before scanning and attaching with the appeal or complaint is filed. There is no prescribed Fee and Format for submitting Complaint before Central Information Commission. There is prescribed fee and format for filing a complaint before some State Information Commissions. You may refer to the respective State RTI Rules for Format and Fee. However, minimum and essential attributes like Name and full address of the complainant, full address of Public Authority and the cause of complaint with specific reference to the section violated must be brought out. All dates and events leading to the complaint must be clearly brought out in chronological order. Eg. Date of submission of RTI Request to PIO, Date of Receipt of RTI Request at PIO's Office. Due date of the decision by PIO. The decision of PIO or No response of PIO and deemed refusal of information etc. Prepare an Index page. Attach self-attested copies of all relied upon papers below complaint in sequence as per Index with page numbers. Complaint relating to Central Government public authorities including PSUs and PSBs and Autonomous bodies must be lodged with Central Information Commission, NEW DELHI. Complaint relating to State public authorities, PSUs, Autonomous bodies and State entities must be lodged to respective State Information Commissions. When there is different benches for State Information Commission, the Compliant must be lodged to the Bench having territorial jurisdiction over the public authority. Complaints pertaining to Subordinate Judiciary must be submitted to the respective State Information Commissions, whereas complaints with respect to High Courts and Supreme Courts must be submitted to Central Information Commission. Created by shrawan on 2015/07/25 05:01.